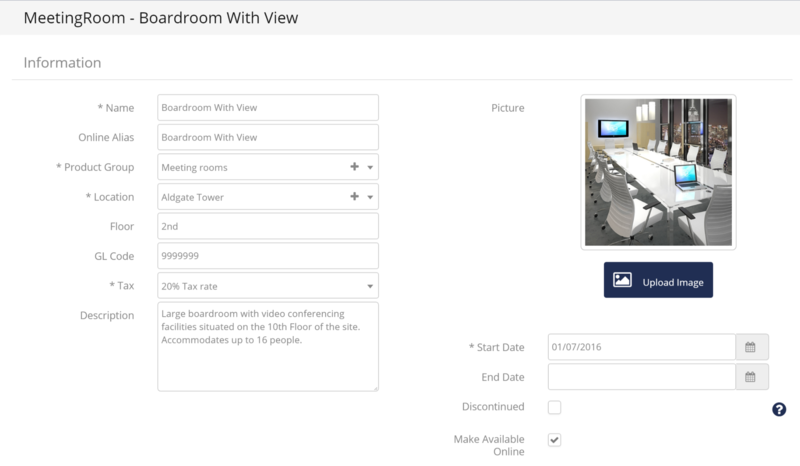 If you are renting meeting rooms at your location, Operate makes it easy for you to manage them, by providing a default product type, which you can use to add information that is specific to such a product. You can ad meeting rooms by going to Space > Products in the top navigation menu. Click Get Started if there is no product in your system, or New if there is. Select Meeting Room to get started. Enter an Online Alias - This is the name of the meeting room that will be displayed on the portal and can be the same as the product name. Select the Product Group to which the Meeting Room belongs. In our example, this will be Meeting Rooms. Add the GL Code to link the revenue to the correct chart of accounts in your accountancy software. Add a Start Date when you want the room to be available and End Date if you want to set a period when the room would no longer be available. Check Make Available Online to allow this Meeting Room to be booked using the external booking widget. Select the Meeting Room Type - This could be a Conference or Meeting Room. Add the Clearance Time - Enter the number of minutes needed to clear the room and make it available for the next booking. Select the Styles that describe the room. Select a style on the left, then use the right side arrow to move the style in the right side panel, to finalize your selection. You can also choose whether you would like any packages or meeting room credits to be applied agaisnt bookings by ticking Include in Meeting Room Discounts, if this option isnt selected customers discounts will not apply to the room. Use the button above the rate fields to toggle between basic and advanced rates. Add rates that correspond to residential clients - internal rates - as well as to non-residential clients - external rates. Mins - Here is where you can change how much an hour lasts / how many minutes your hourly rate includes. Lowest - Lets you set the lower time limit under which you would charge the rate to which the value corresponds. Highest - The upper time limit, which if reached, would determine the client to be charged the next rate. For example, if a customer spends 3h20min in your space, you can set this as a Lowest value under the hourly rate and only charge the customer for 3h, at the hourly price. If the customer sends 3h30 mins in your space, then they would be charged for 4 h, applying the four hour rate. Learn more about how meeting room bookings interact with meeting room rates. note that ammending the availability will not make the meeting room appear under the location within the calendar - it will make the meeting room available for use by customers at the locations for which it has been made available. This is used to add a related space that already exists in the system - For example, you might separately rent the desks that are found within this meeting room; or rent the entire meeting room. In such a case, you simply need to select the desks as related spaces. Or you have a meeting room that can be booked as one large meeting room or divided and booked as two separate rooms, you need to create 3 meeting rooms: The two individual rooms( without related spaces) and the whole room with the individual rooms as related spaces. Hide From Point of Sale is great to use for products that you are never selling through the Point of Sale feature, which you would generally use for auxiliary products such as food and drinks. Office space fits into this category.